Serve two potato halves as a main dish or serve one as a side dish. 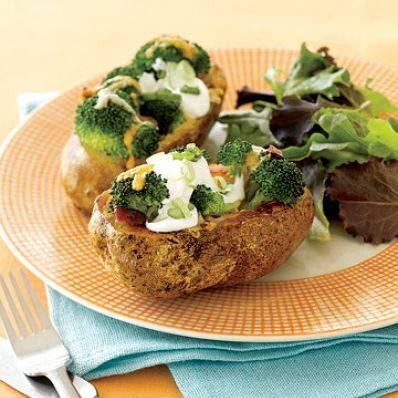 The salad topping provides a fresh counterpoint to the savory bacon, broccoli, and cheese filling. 1 of 5 Scrub potatoes and pierce with a fork. Place on paper towels. Microwave on HIGH for 16 minutes or until tender. 2 of 5 Cook bacon in large skillet over medium heat until crisp. Drain on paper towels. Cook broccoli in boiling salted water for 4 minutes. Drain and set aside. 3 of 5 Position rack about 6 inches from the oven top. Heat broiler. 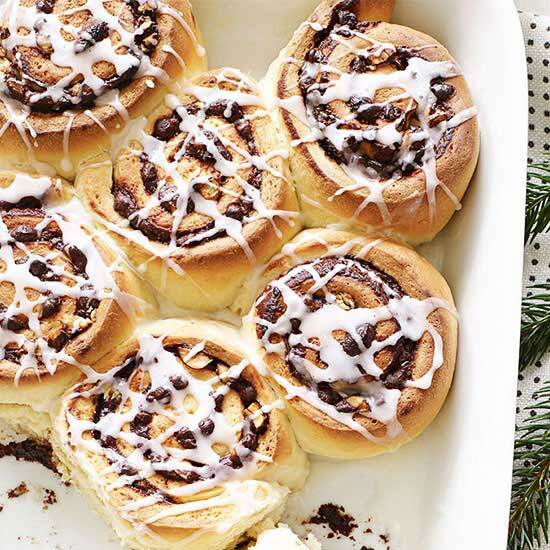 Line a baking sheet with nonstick foil. Slice potatoes in half lengthwise; scoop out flesh, leaving about 1/4-inch edge. Place, cut- side down, on prepared sheet. Coat skin with nonstick spray. Broil 3 minutes. 4 of 5 Remove potato skins from oven. Flip over (skin side down). Sprinkle each with 2 tablespoons of the cheese, then top each with 1 slice bacon, crumbled. Top bacon with about 1/4 cup broccoli in each. Season broccoli with salt and pepper. Top each half with 2 tablespoons cheese. 5 of 5 Broil 4 minutes, until heated; serve with sour cream, scallions and salad. Per Serving: 7 g sat. fat, 38 mg chol., 32 g carb., 25 g pro., 14 g Fat, total, 895 mg sodium, 4 g fiber, 350 kcal cal.